C.C. 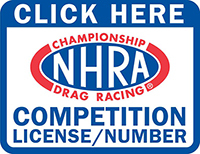 DRAGWAY TRACK INFO HOTLINE: 410-287-5486 WELCOME TO WWW.CECILCOUNTYDRAGWAY.COM! Ever wonder what you and your car or truck could do on a timed 1/4 mile? At Cecil County Dragway, the opportunity awaits. In a safe environment where our trained and experienced staff can assist you. Who knows? Maybe you'll be the next John Force or Shirley Muldowney. There's only one way to rock, Cecil County Dragway! Cecil County Dragway is conveniently located off I-95 in Rising Sun, MD. CLICK HERE FOR HOTELS & ACCOMODATIONS! Race Track is on the left. Site best viewed in IE 5.0+ or Mozilla @ 1024x768 Resolution. Copyright � 2005, Cecil County Dragway, Inc. All Rights Reserved. Cecil County Dragway, Inc. reserves the right to change content and or specifications without notice.